Donald Trump's former attorney Michael Cohen gives his prepared opening statement before the House Oversight Committee. 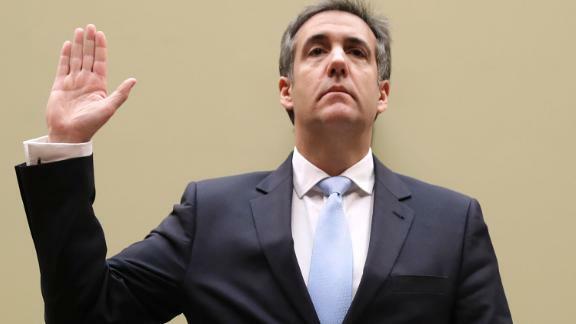 Michael Cohen's testimony Wednesday represented the biggest moment to date for House Democrats and their sweeping investigation into every aspect of President Donald Trump's life. Cohen implicated Trump on numerous fronts, from hush-money payments during the campaign to financial shenanigans at the Trump Organization to orchestrating lies while he was in the Oval Office. And he maligned the President's character, calling him a "racist" and a "conman." Republicans and the White House dismissed Cohen, calling him a convicted liar motivated by greed. But the hearing made clear that Cohen's allegations will be a jumping off point for Democrats to probe deeper into Trump's world. For the first time in a nationally televised setting, Cohen accused the President of directing him to commit the crimes he pleaded guilty to last year when he paid hush money to women alleging they had affairs with Trump. But Cohen went further than that. He displayed a copy of the check that Trump signed to reimburse him, and he said that Trump told him to lie publicly in February 2018 that Trump had any knowledge of the payment. Beyond that, Cohen claimed Roger Stone told Trump that he has spoken to WikiLeaks founder Julian Assange and there would be an email leak forthcoming. And he explained why he thought Donald Trump Jr. had told his father in advance about the 2016 Trump Tower meeting with a Russian lawyer promising dirt on Hillary Clinton. Those charges weren't as solid, however, as the allegations involving the payments to women, which in a vacuum -- a presidential candidate directing payments to silence women alleging affairs -- is a remarkable accusation. It underscores the notion that Trump's campaign finance issues could ultimately prove to be his biggest potential liability. Cohen also said he could not discuss his last conversation with Trump that occurred after the FBI raid of his offices, citing an ongoing investigation from federal prosecutors in New York. Trump's former lawyer said he was "aware" of wrongdoing or illegal acts that involved Trump, but he could not talk about them because they are currently under investigation. Cohen's testimony showed plenty of possible exposure for those in Trump's orbit on several fronts. Several Trump associates are likely to be hearing from Congress soon enough -- most notably Trump Organization CFO Allen Weisselberg -- as multiple Democrats asked Cohen to name names when it came to questions about Trump's finances. Cohen provided financial statements from 2011 and 2013 given to Deutsche Bank in an attempt to ask about a loan to buy the Buffalo Bills, suggesting Trump inflated his income when it suited his interests. Cohen told Rep. Alexandria Ocasio-Cortez that Trump had also provided inflated assets to an insurance company, which the New York Democrat said was a reason that Congress should see Trump's financial statements and tax returns. Rep. Stephen Lynch, D-Massachusetts, said the hearing could help give the Ways and Means Committee "probable cause" to subpoena Trump's tax records. Cummings said after the hearing that he would "probably" bring in both Weisselberg and Trump Jr. for questioning. Republicans came into Wednesday's hearing with a clear strategy: attack Michael Cohen's credibility. They aggressively went after Cohen's crimes that weren't tied to the hush-money payments -- lying to Congress, cheating on his taxes -- to paint him as an uncredible witness whose accusations were meaningless. The GOP side also gave its two most vocal attack dogs -- ranking member Jim Jordan of Ohio and Mark Meadows of North Carolina -- ample time to press Cohen, with most Republicans deferring their final minute to one of the two House Freedom Caucus leaders. But they largely avoided trying to defend Trump against Cohen's allegations. Instead, they worked to muddy the waters by raising questions about Cohen's character, even accusing him of lying during his testimony on Wednesday. And Republicans put Cohen on the defensive about whether he wanted to work at the White House, after he insisted in his testimony that he did not despite federal prosecutors stating in court filings Cohen had told friends he expected a prominent position. After the hearing, Meadows said there were six inconsistencies that they planned to probe. Cohen spent most of the day criticizing his former boss. But he also ruled out some of the more salacious accusations that have been leveled against Trump. Cohen was asked about multiple rumored tapes of Trump, including a claim of alleged "catch-and-kill" footage of Trump striking his wife, Melania Trump. "I have no reason to believe that tape exists," Cohen said. "I don't believe Mr. Trump ever struck Mrs. Trump, ever." Later, Cohen was asked if there are any tapes that could be the subject of "extortion or blackmail" -- a reference to long rumored Russian kompromat. "I've heard about these tapes for a long time, I've had many people contact me over the years -- I have no reason to believe that that tape exists," Cohen said. And Cohen also shot down the notion of a "love child." "There is not, to the best of my knowledge." More significantly, Cohen said he did not believe that Trump had directed Stone to reach out to WikiLeaks. While Cohen accused Trump of learning from Stone about a WikiLeaks' email dump, he said Stone was "freelancing." Testimony contradicts Stone and Trump Jr.
Cohen's testimony is at odds with statements from several other key witnesses, including Stone and Trump Jr. It's not clear whether Cohen opened anyone up to legal scrutiny, but he did raise questions about what key Trump officials have previously testified. Trump Jr., for instance, has denied telling his father ahead of time about the June 2016 Trump Tower meeting. Cohen said he thought he heard such a conversation occur -- though he didn't have proof. "Don Jr. came into the room and walked behind his father's desk -- which in itself was unusual," Cohen said. "I recalled Don Jr. leaning over to his father and speaking in a low voice, which I could clearly hear, and saying: 'The meeting is all set.' I remember Mr. Trump saying, 'OK good ... let me know.'" But Cohen raised other potential issues for Trump's eldest son. He said that he briefed Trump Jr. and Ivanka Trump 10 times about the Trump Tower Moscow project. Trump Jr. told the Senate Judiciary Committee in September 2017 that he knew "very little" about the project. "I was peripherally aware of it, but most of my knowledge has been gained since," Trump Jr. testified. WikiLeaks tweeted on Wednesday that Assange "has never had a telephone call with Roger Stone." Cohen is known for his work in the Trump Organization, and he never worked in the White House. But his testimony makes clear that Trump's problems with Cohen's allegations stretch directly into the Oval Office. While the two hush-money payments occurred before Trump was elected President, Trump was paying back Cohen while he was in the White House, as Cohen testified. And Trump spoke to Cohen last year about directing the public fallout from the payments, directing him to lie about Trump's knowledge of the payments, Cohen said. In addition, Cohen said that he went over his false testimony with Trump's lawyers in the White House -- and spoke to Trump ahead of his testimony. Rep. Gerry Connolly, a Virginia Democrat, asked Cohen about an email that Trump had requested a meeting with Cohen and the President's former attorney Jay Sekulow, where he said he discussed his upcoming testimony. Cohen said his statement was edited by Trump's attorneys. And he claimed the President was suggesting he lie to Congress, even if he didn't say it directly. Instead, Cohen said that Trump did not "directly" tell him to lie to Congress, but that Trump would tell him personally and the public that he had "no business" with Russia, even as he was negotiating the Moscow project. In a statement, Sekulow responded that Cohen's testimony about editing the Trump Tower Moscow testimony was "completely false."